These sewing tips are specific to my quilts and the techniques I use. I will notify you via my blog as and when I add new tips! However, there are many techniques involved in making a quilt which I do not cover here and that are not explained in my quilt patterns. If you are new to patchwork and quilting or would just like to improve your skills you will find some excellent patchwork and quilting tutorials on the internet, for example, I have found http://quilting.about.com to be very good. The examples below are all made using my free runner duck pattern so you can see how it looks when sewn in different applique methods. All my patterns can be used with any applique method - though just remember to add a small seam allowance for needle turn techniques. My favourite method is free motion machine applique. This method quickly breathes life and energy into your applique and you do not have to change the thread and bobbin colours constantly either! I love it! Below, I've provided a detailed step by step tutorial to help you embrace this technique. 1. Begin: Follow steps 1 to 3 in my free runner duck pattern to make the unembellished duck. My machine also prefers to draw with a new sharp needle (it skips stitches otherwise). Use thread in a contrasting colour to your applique. 3. Start drawing: Now, just be confident, put your foot down and go for it! Remember that you move the fabric and control the length of the stitches. Also remember that the machine is going fast, but you do not have to as well! If you move the fabric quickly your stitches will be large and if you move the fabric slowly your stitches will be small. You are not aiming for stitches of exactly the same length - you are trying to add movement and character to your runner duck! 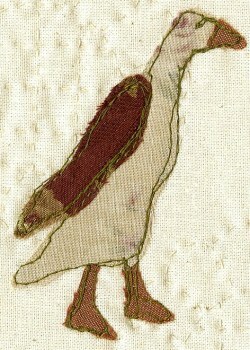 Try not to stop sewing once you have started and go round the duck a couple of times. As you can see I do not worry about going over the edges; in fact, I feel the opposite- I think it adds to the applique. 4. Finish: If you stitch in the same place at the beginning and end, you shouldn't need to secure the thread ends, just take them to the back and cut them. Machine drawing can be unpicked- but is absolutely no fun, so if it all goes wrong (and it does sometimes) I normally choose to throw it away and start again. Now, doesn't it look great, and so full of life and movement! 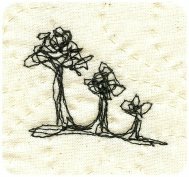 What will you draw with your sewing machine next?